I started off the A to Z challenge by bringing you the story of the brilliant Indian chess grandmaster Viswanathan Anand. Today I will bring you the story of yet another genius who played the game of chess and who was as controversial as he was brilliant. The old-timers among you might have guessed who I am referring to. It is none other than Robert James Fischer popularly known as Bobby Fischer. Fischer was born in Illinois on March 9, 1943. Though his birth certificate lists his father as Hans-Gerhardt Fischer a German Biophysicist there is some belief that his biological father was Paul Nemenyi who was a Hungarian mathematician and physicist of Jewish origin. Compelling evidence of this was published in The Philadelphia Inquirer in an investigative report in 2002. His mother was Regina Fischer who was of Jewish origin. Fischer had a sibling by the name Joan Fischer. Bobby and his sister bought a Chess board at a candy store when they were six and using the instruction booklet provided along with the board they played against each other. Soon Joan lost interest and since Bobby's mother Regina was busy with work, Fischer was left to play with himself. After some time the family shifted to Brooklyn and Regina found that Bobby was getting excessively obsessed with chess and this greatly worried her. She tried to place an ad in a newspaper asking if there were other children of Bobby's age who could play chess with him, but the papers rejected her ad. But one newspaper 'The Brooklyn Eagle' forwarded her enquiry to Herman Helms who was the "Dean of American Chess". This led to Bobby getting an opportunity to play against Master Max Pavey, the former Scottish champion. Though Bobby lost to Pavey, he held him for fifteen minutes and one of the onlookers of the game Carmine Nigro, who was also an instructor decided to teach Bobby chess. In Fischer's own words, though Nigro was not a brilliant player, he was definitely a good teacher. This was one of the turning points of his life that led Bobby Fischer to take up chess in right earnest. Fischer then attended the Hawthorne Chess club based in chess master Jack W Collins home. Collins took pleasure in teaching young children chess. Bobby really developed strong skills in chess by playing many blitz games with Collins and several other experts. 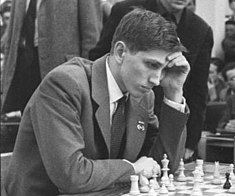 In 1956 Bobby Fischer was rated 1726 in the national rating list of the United States Chess Federation, which was 900 points below the top-rated Samuel Reshevsky. His rating increased rapidly that year. In July 1956 Bobby Fischer won the US Junior Chess Championship at the tender age of thirteen. He was the youngest to win this championship. In November of the same year, he tied for the second spot with William Lombardy, Nicholas Rossolimo and Arthur Feuerstein in the Eastern States Open Championship in Washington DC. In 1957 Fischer played a two-game match against former world champion Max Euwe at New York losing 1/2 - 1 1/2. In the USCF national rating of 1957, Fischer was rated 2231, over 500 points higher than his rating in 1956. Fischer was invited to play in the 1957-58 US Open Championship by the USCF. The tournament boasted of several luminaries like six-time champion Samuel Rehshevsky, defending champion Arthur Bisguier and William Lombardy. Fischer scored eight wins in a row and five draws and became the youngest ever US Champion. This was against the predictions of most chess experts. Bobby then went to Russia where the Soviet Union invited him to Moscow. As soon as he landed in Moscow, Fischer demanded that he be allowed to play speed chess with the Soviet masters. He played the Soviet grandmasters Evgeni Vasuiko and Alexander Nikitin winning every game. The Soviet grandmaster Vladimir Alatortsev also lost. Fischer was full of arrogant self-confidence at the age of fifteen. Fischer then wanted to play against the reigning world champion Mikhail Botvinnik but was told that this was impossible. Finally, Tigran Petrosian was summoned to the club on an unofficial basis and he played speed chess with Fischer and Tigran won the majority of the games played. When Fischer found that he would not be playing any official games in the Soviet Union in that visit he got enraged and publicly said 'I am fed up of these Russian pigs'. This enraged the Soviets who had thought of Fischer as their honoured guest. Fischer used to dress atrociously till the time he was fifteen but later he took to dressing smartly. By 1966-67 Fischer had played in eight US national championships and had won all of them. Fischer represented the United States at first board on four chess Olympiads winning two silver and two Bronze medals. In 1970 and 1971 Fischer dominated chess world totally. He was way ahead of his contemporaries. In March and April of the year in the USSR vs The Rest Of the World championship, Fischer was simply swashbuckling. In July 1972, Fischer's rating was 2785 points and this put him on the cover of the Life magazine. It was in the year 1972 that Fischer finally became the world champion. The reigning champion was Boris Spassky of the Soviet Union. The championship was played as the best of 24 matches with wins counting as 1 point and draws counting as 1/2 a point and would end when one of the players reached 12 1/2 points. The matches were scheduled to be played in the Laugardalsholl arena in Reykjavik. The players were expected to play three games every week. This championship was marked by Fischer's extraordinary demands on things like what kind of chess board to be used and several other issues on which he refused to compromise. This championship raised a lot of interest among chess-playing nations all over the globe. They finally began after a lot of fanfare. The first two games were won by Boris Spassky. After the losses in the first two games, Fischer nearly left Iceland but was stopped by his second William Lombardy. In the third game, Spassky agreed to Fischer's demand of playing the third game in a back room of the stage without any cameras. The third game proved to be the turning point and Fischer won it. This was his first win against Spassky. The fourth game was again played in the hall as per Spassky's request but Fischer insisted that there should be no cameras which the authorities acquiesced to. This game ended in a draw. Game 5 was won by Fischer and now the two players were level at 2 1/2 - 2 1/2. It is believed that at this point Fischer gave Lombardy a hint that he had some surprises in store for Game 6. Fischer won this game and it is believed to be a masterpiece of chess play and Spassky joined the audience in applauding Fischer. Fischer was stunned by this show of appreciation and called Spassky a true sportsman. Game 7 was a draw. Game 8 went to Fischer. Game 9 was again a draw. Game 10 again went to Fischer. Game 11 went to Spassky. Game 12 was again a draw. Game 13 was a win for Fischer even though Spassky was in a fantastic position. For a long time after the game had ended Spassky could not believe he had lost and could not understand what had gone wrong. He had been in such a strong position. The former world champion Mikhail Botvinnik called this game the highest creative achievement of Bobby Fischer. Game 14 was played after a postponement but eventually ended in a draw. Games 15, 16, 17, 18, 19 and 20 were again drawn. And Game 21 turned out to be the last game of the title. Fischer played brilliantly and Spassky resigned by phone. The final score was 12 1/2 - 8 1/2 in Fischer's favour and he had emerged as the eleventh world champion. In all Fischer won seven games and there were eleven draws. The crushing manner in which Fischer defeated Spassky made him an instant celebrity and he was offered several product endorsements which he declined. A movie titled Pawn Sacrifice was made in 2014 based on this championship match. The role of Bobby Fischer was played by Toby Macguire. The movie was directed by Edward Zwick and written by Steven Knight. Boris Spassky's role was played by Liev Schreiber and Peter Saarsgard played William Lombardy. Fischer was slated to defend his title against Anatoly Karpov in 1975 but Fischer laid down certain conditions. These were that the matches should continue till one player wins ten games without counting draws. His other conditions were that there should be no limit to the number of games played and in case of a 9-9 score the defending champion would retain the title and the prize money would be split equally. FIDE agreed to the ten game condition but rejected the other two. Fischer would not relent and finally had to forfeit his title. After that Fischer faded into obscurity. He did not play a single game for nearly twenty years. He associated himself with an apocalyptic cult named "Worldwide Church of God" briefly. In 1981 he was arrested by a patrol policeman who claimed that Fischer resembled a man who had robbed a bank. Fischer claimed he was imprisoned and tortured for a number of days and claimed there was a conspiracy against him. Fischer again played a match against Boris Spassky in 1992 which was termed the "Revenge Match of the 20th Century". Fischer won the match with ten wins, five losses and fifteen draws. Fischer rejected any attempts to label him as a jew. Fischer exhibited his anti-semitism by making numerous statements. Fischer blamed his mother for not being present for him as a mother and her admiration for the Soviet Union. Some authors believe that this led to his deep resentment of the Soviet Union. The 1992 match took place in Yugoslavia when the United Nations had placed a commercial embargo on that country. Because of this, Fischer was a fugitive after playing this match. He took residence in Budapest in Hungary and was in a relationship with a young Hungarian chess master Zita Rajccsanyi. From 2000 to 2002 Fischer lived in the Philippines. He got involved with a young twenty-two-year-old woman named Marilyn Young who gave birth to a daughter Jinky Young. Marilyn claimed that Fischer was her father. When he was interviewed on Radio about the September 11 attacks Fischer controversially said, 'I applaud the act. Look nobody gets...that the US and Israel have been slaughtering the Palestinians for years...'. His other controversial statements were 'The horrible behaviour that the US is committing all over the world ... This just shows you, that what goes around, comes around even for the United States'. He also expressed a wish that the US would be taken over by a military coup, all the synagogues destroyed and all the Jews murdered. Fischer was then arrested in Japan. Trying to avoid deportation to the US, Fischer requested the Icelandic government for full citizenship which was finally granted after overcoming some hurdles. He lived in Reykjavik, Iceland as a recluse. Fischer died on January 17, 2008, at the age of sixty-four from renal failure and is buried at the cemetery of the Laugardaelir church. There is no doubt that Fischer had psychological issues that were not identified and because of which not dealt with. But what a genius he was! Your most interesting post so far, Jai. Really emjoyed getting to know Bobby Fischer. Yes he had problems which was why I have used the word 'twisted' in the title. There are a lot of unverified rumours about him that I could not validate and hence have not mentioned. A truly great player. Oh man! Where to start about Bobby Fischer? Conspiracies surrounded him when he was alive, and conspiracies keep swirling even after he sadly passed away. A genius, albeit a tormented one at that. There's a movie called Pawn Sacrifice made about Bobby Fischer. You need to watch that, Jai. There are a lot of make-believe stories centering around Fischer. I have mentioned the movie Pawn Sacrifice in the post. I have also partially seen the movie. Found this post as the most intetesting one, glad to know about him in details. Yes, Fischer's is a rare story. He was a genius with a problem. Thanks for visiting. This is by far your best post in this series. I have read about Fischer though most of the facts are unverified. What a twisted and tormented character. Yes, a twisted, tortured but brilliant soul. His story is definitely very interesting and he was a genius. Thanks for visiting. One of the brilliant personality I have heard in sports field. He will be inspiration forever. What an amazing story of a boy who was obsessed with chess and went on to become victorius in the same. Great read! He is an interesting personality, I have read a few controversies on Ficher earlier in a sports journal. This is a reminder of that fade memory. This series will be for keepers, a treasure chest of all time known sports personalities. He was a very controversial player. There are enough tales about him. Thanks for reading. Yes. He was never formally diagnosed but the general belief is he was schizophrenic. Thanks for visiting. At the age of 15, when fame touched his feet it is human tendency to turn arrogant. It is said a genius may have mental problems. What an interesting chessplayer was Bobby Fischer. That is a very valid point. Fame at a young age does make a person lose his or her balance. Thanks for the comment. Ohhh! you are bringing out some amazing champions of sports who have been lost in time. Awesome work sirji. Thanks for visiting and reading Manas. Ah, I had heard of Fischer's twisted mind! But reading about that world championship match gave me goosebumps! Wow! Yes, It was a very controversial match and as I mentioned a movie was made on it and it was a hit. Wow that's a well researched post, I even asked my elder kiddo to read and he liked it too. Happy my post will serve as an educational tool for your kid. Thanks for visiting. Thanks for introducing a new sports personality to me. 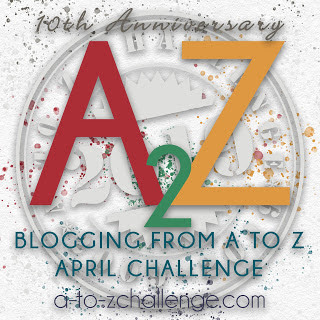 Your A to Z posts are coming up brilliantly, Jai. The kind of research you're putting into bringing the personal and professional lives of every sportsperson you write about is indeed praiseworthy. Bobby Fischer needs no introduction. He was an absolute genius and was scores above any competition. His psychological issues do seem to have gone largely undetected. Pity that such an impressive personality had such a rocky life. Thanks for the kind words Varsh. I am happy you have heard of him as most people don't seem to know about him. Yes, he was indeed a twisted genius who lived a troubled life.